A workhouse was erected here about a Year and a half since, with so good Success, that the Collection for the Poor is already reduced from 360l. to 170l. per Annum. The Charity-School is joined to it, and by the admirable Management of the Promoters of the Workhouse, it is hoped that in a few Years the Poor will be able to maintain themselves without any Parish Collection. A parliamentary report of 1777 listed parish workhouses at Stockport (for up to 60 inmates) and Marple (9 inmates). County of Chester: Bramhall, Bredbury, Brinnington, Cheadle Bulkley, Cheadle Mosley, Hyde (2), Marple, Norbury, Offerton, Romilly, Stockport (4), Stockport Etchells, Torkington, Werneth. County of Lancaster: Heaton Norris (2), Reddish. Later additions: Bosden (1877), Compstall (1897), Handforth (1877), Hazel Grove and Bramhall (1900). The population falling within the union at the 1831 census had been 68,906 — ranging from Torkington (population 284) to Stockport (25,469). Stockport, like a number of other many northern manufacturing towns, was the scene of some resistance to the 1834 Poor Law Amendment Act. On 23rd January 1837, a meeting of local ratepayers was held in the town to nominate people for the office of Guardian. The meeting's chairman, Mr Rawlinson, expressed opposition to many clauses on the 1834 Act but asked speakers to confine themselves to the business in hand. However, several present criticized the Act as 'unchristian and unconstitutional' urged that no Guardians be nominated. The meeting eventually broke up in disarray. Initially, the new Stockport Union continued to use an existing parish workhouse, but a new building was erected in 1841-2. Soon after its opening there was a widespread manufacturing slump which led to demonstrations and riots in many northern areas. 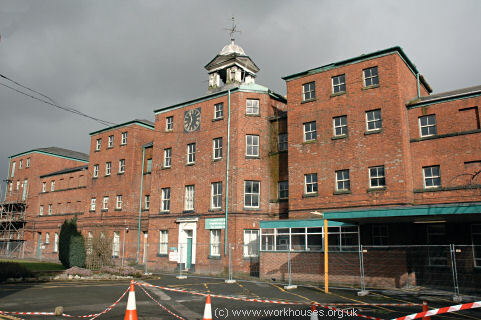 In August 1842, Stockport's workhouse was the subject of an attack by a mob of unemployed workers as described in a contemporary news report. There are upwards of 20,000 persons out of employment in this place, who have no resources but those of plunder and beggary. On Saturday fourteen of those who took a conspicuous part in the riot and breaking open of the workhouse were committed to the nest Chester assizes for trial. The deluded men will have to remain six months in prison before their cases can be heard. Meetings continue to take place on the Waterloo-road, which are attended by many thousand persons. They are addressed by Doyle, Ellis, and other agitators. In their speeches yesterday they stated that the Tories, the Church, and the bishops, had caused the present state of things, and advised them to go round to all the shopkeepers to solicit alms. On Thursday morning a large body of rioters from Hyde invaded Stockport, and succeeded in turning out the people employed in the mills, hat-manufactories, print-works, &c. They were afterwards reinforced by large bodies from the neighbourhood, and held a meeting of very formidable appearance. Owing, however, to the presence of the Altrincham, Dunham Massey, Tabley, and Stockport troops of the Cheshire Yeomanry, the peace was fortunately preserved. 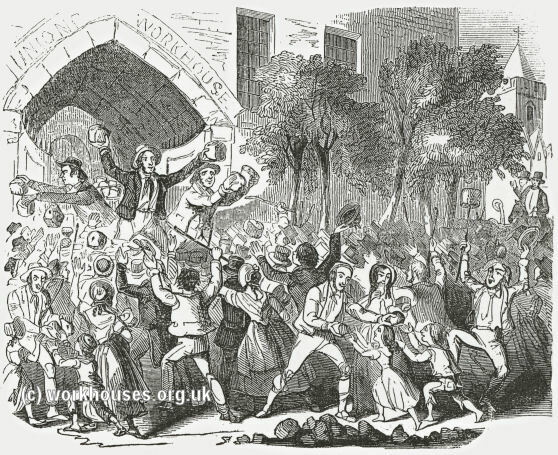 The more remarkable features of the proceedings in Stockport were the extortion of money from mill-owners as well as shopkeepers, and an attack on the New Union Workhouse, Shaw-heath, where the mob forced an entrance, and immediately commenced to help themselves to bread and money. No fewer than 672 seven pound loaves were taken away, and about £7 in copper. Information of this was conveyed to the authorities, and they hastened to the spot with the constables, yeomanry, and infantry, and captured about forty of the rioters, several of whom, however, were subsequently rescued. This occurred on Wednesday, and Thursday was spent in speechifying, parading Stockport, and planning future movements. On Friday morning the great body of the Stockport rioters departed for Macclesfield. All business at Stockport and the neighbourhood is effectually stopped. Stockport workhouse under attack, 1842. 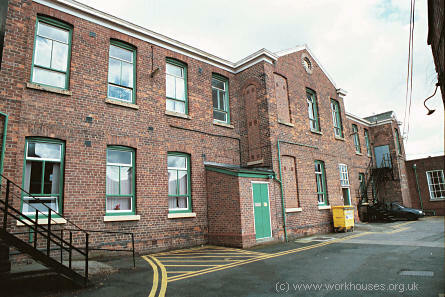 The new workhouse was designed by Henry Bowman who was also responsible for the Congleton workhouse. 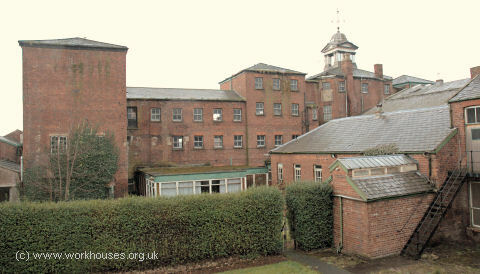 The new workhouse was built at Shaw Heath and was intended to accommodate up to 690 inmates. Its location and layout are shown on the 1851 map below. The workhouse comprised a two-storey entrance block facing the main road at the south-west. Assorted other buildings were subsequently added at each side. Stockport general view from the south, 2006. The main accommodation building stood to the rear. It was substantial red-brick building, largely four storeys high. Males were accommodated at the north side and females at the south. Children's quarters and school rooms were located in cross wings at each end of the main block, with the area to the front containing enclosed boys' and girls' exercise yards. To the rear, the men's and women's sides were divided by the kitchens, dining-hall and bakery. A wash-house and drying ground for laundering linen and clothes were located at the women's side, while a smithy and pig-sties were placed at the men's side. Stockport main building from the south, 2006. 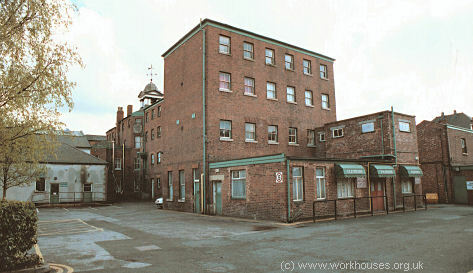 Stockport rear of main building from the north, 2001. Stockport rear of main building from the east, 2006. 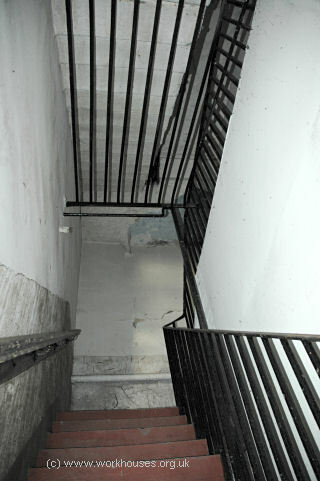 The floors of the main block were connected by a concrete staircase. This one has overhead rails fitted — presumably to prevent inmates falling or jumping down the central well. Stockport internal staircase with protective overhead rails. Stockport top floor of central hub. 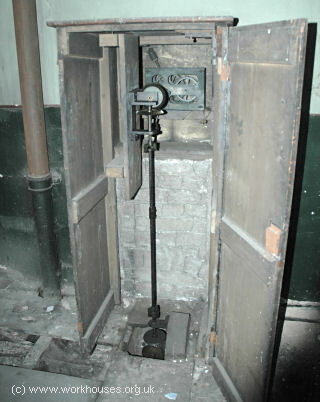 The workhouse had clocks on three sides — the original clock mechanisms still operate. The upper dormitory floors of the boys' and girls wings were connected by an internal staircase. Stockport third floor of girls' wing. 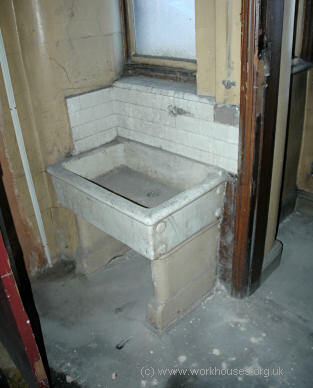 Communal washing facilities in the workhouse appear to have been very modest. This sink on one of the landings served a large part of the women's side. The workhouse walls were emulsioned many times. 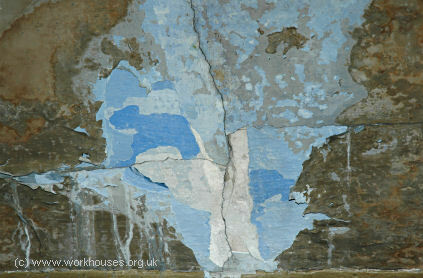 In earlier times a distinctive "hospital blue" shade was used — traces of which could still be found in recent times. A separate hospital block was later erected at the north of the site. Stockport hospital block from the west, 2001. In 1894, the British Medical Journal set up a "commission" to investigate conditions in provincial workhouses and their infirmaries. On their visit to Stockport, the commission found that due to a trade depression, inmates in the workhouse were "packed like sardines in a tin." The management of the hospital appeared to be "completely without plan or method" and the female wards were "comfortless and barnlike". Many wards were so crowded as to present a serious danger in the case of fire. Former school rooms had been pressed into service as wards for the old and infirm. 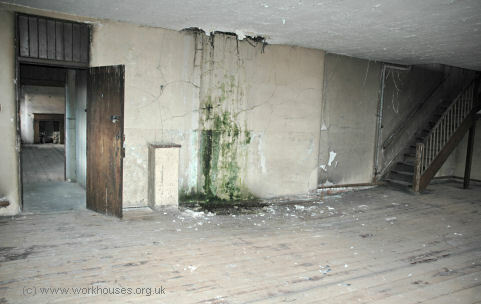 There were no day rooms and the men smoked in the wards, often being confined there for days on end during the winter. The workhouse staff, though, were praised for their energy and for doing their utmost for the patients under most discouraging circumstances. The commission's report recommended that the only remedy was the building of a new infirmary — a course of action also urged by the Local Government Board, but to which there was local opposition. Further details are available in the full report. In 1905, a new office and board-room block was erected at the west of the workhouse site at the corner of Flint Street. Stockport Union offices from the south, 2006. The later layout of the site is shown on the 1910 map below. 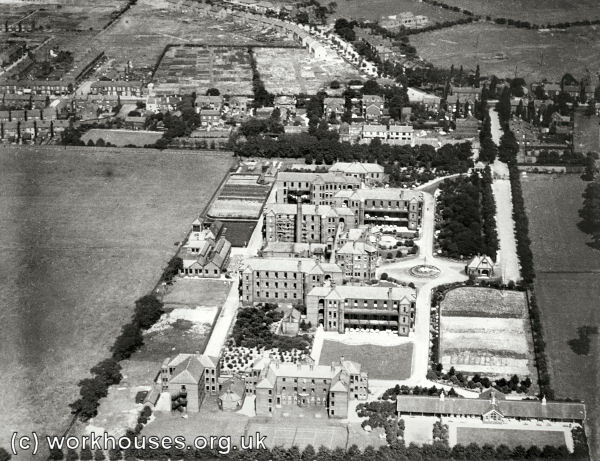 The workhouse later became Shaw Heath Hospital, then from 1954 was known as St Thomas' Hospital. 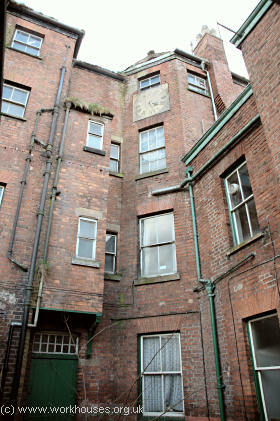 The hospital finally closed in 2004 and the site was acquired by Stockport College as part of their campus expansion. 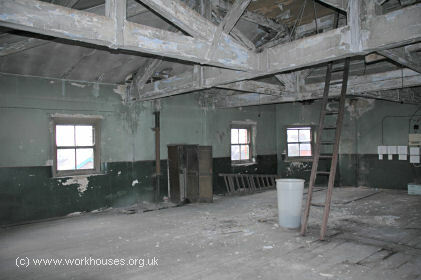 The main workhouse building and some other blocks were planned to be retained and refurbished although have since remained disused. Interestingly, the Rector of St Thomas' church is still the official chaplain to the workhouse. To this day, he receives a small annual cheque for this post which is then deducted from his salary as rector. 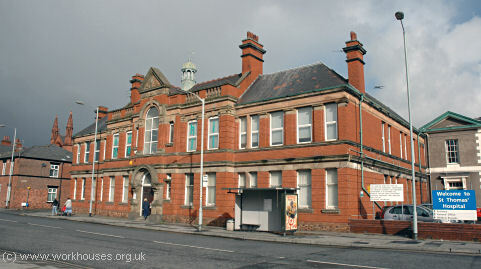 By 1894, as noted above, the Stockport Guardians came under pressure from the Local Government Board to improve their medical facilities by establishing a new infirmary. Building work on this establishment finally got underway in 1901 on a site at Stepping Hill, to the south-east of Stockport. It was formally opened in December 1905 by Mr G.N, Andrew, Chairman of the Stockport Guardians. 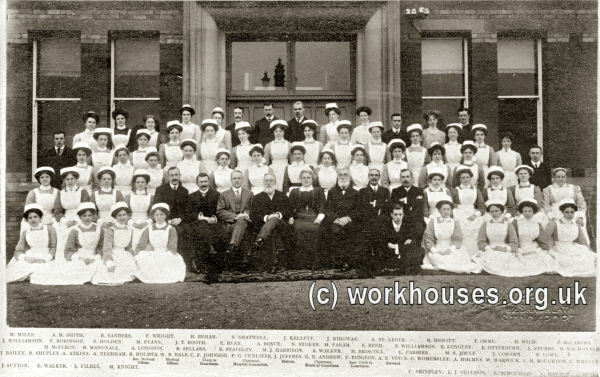 Stepping Hill Infirmary staff and union officers, 1905. The buildings, designed by WH Ward, could accommodate 340 patients, plus 36 nurses, and 24 other staff. The layout was a typical pavilion-plan design with a central administration block flanked by pairs of three-storey nightingale ward blocks all linked together on each floor by an open-air walkway. Other blocks housed maternity and lying-in wards, nurses' home, laundry, mortuary. A porter's lodge stood at the entrance to the site on Poplar Grove. Stepping Hill aerial view from the south-west, 1927. The three-storey administration block contained quarters for the matron, medical officer and steward, a committee room, dispensary, kitchens, stores, and boiler room. A lift adjacent to the kitchen allowed food to be transferred to the corridor at each level for distribution to the upper floors of each ward block. Stepping Hill administration block from the south-east, c.1913. Each floor of the ward pavilions was 24 feet wide by 72 feet long and contained 24 beds — 12 along each side, with a window placed in between each pair of beds. The nurses' duty room lay at the end of the ward nearest the linking corridor, while the farther end housed baths, toilets, escape stairs, and a verandah. 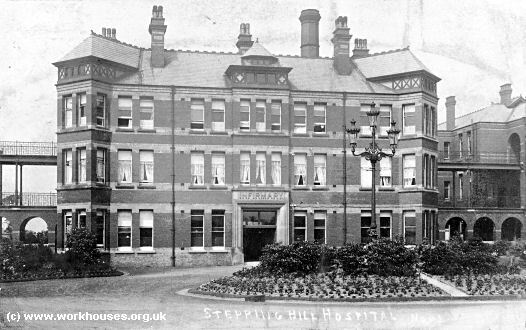 Stepping Hill infirmary from the south-east, c.1913. Some of the original infirmary buildings survive as part of the much enlarged Stepping Hill Hospital. 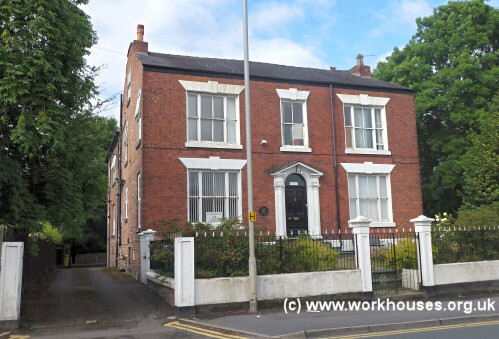 In the early 1900s, following the trend to house pauper children away from the workhouse, the Stockport Union established a number of 'scattered homes' in and around the town. These included properties at: 2 Hall Street; 1 Mount Vernon, Turncroft Lane; 20-26 St Thomas's Place; Brook House, 41 Bank Lane; and The Cottage, Heaton Road, Heaton Norris. Each housed a number of children together with a house mother. The scattered home at 2 Hall Street, 2013. Stockport Archives, Central Library, Wellington Road South, Stockport SK1 3RS. Most records were destroyed during World War 2. Surviving records include: Workhouse Births and Deaths (1850-1904, indexed); Lists of inmates and removals (1841-3); Lists of paupers (1837-43, 1853-73 with gaps; Register of deaths and diseases (1874-95); etc.